Release show for There Is An End In Everything That Comes Into Being. 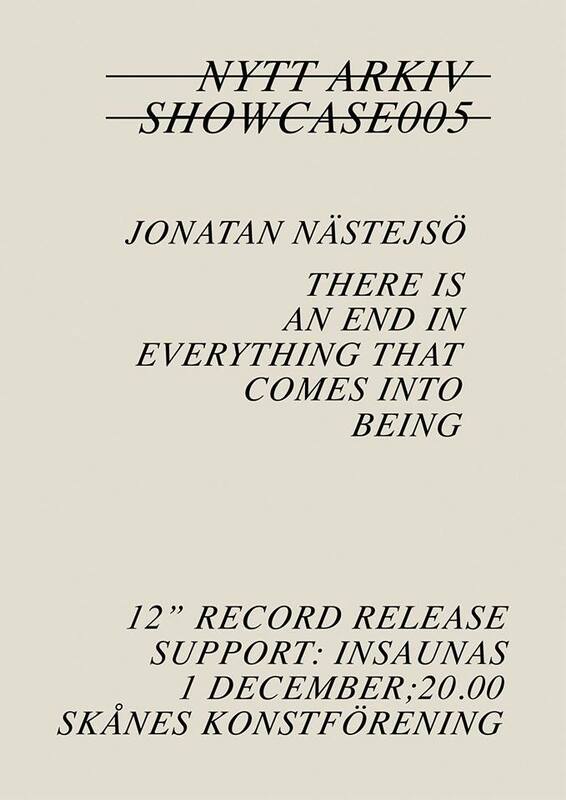 Jonatan’s new work has abandoned the warm and enclosing natural sounds of his earlier albums and we are now presented with piano, echo, synthesizers, and a soundscape which has moved towards something spacious and barren. The album was first recorded in 2012, however, after having his computer stolen the files were lost. After a curious turn of events .wav files of the album could be recovered through email exchanges. We are very pleased to present an album that has been birthed, lost, recovered, and finally completed. Now, as we release it to you it ends. Available on limited edition vinyl and on all major streaming platforms. Neofolk from Malmö. 12” debut album out on Nytt Arkiv in spring 2019. Vinyl + door: 140 kronor.